Commencing at Cape Reinga lighthouse at the top of the North Island the trail takes in some amazing sites along the 3000 km route. 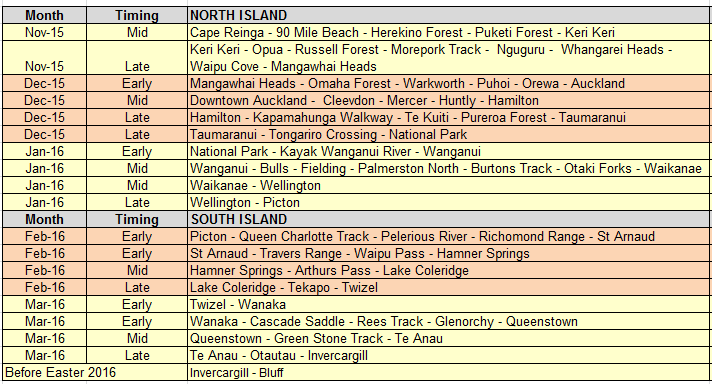 I’ll be aiming to stick to the main route as much as possible with one major deviation on the South Island. 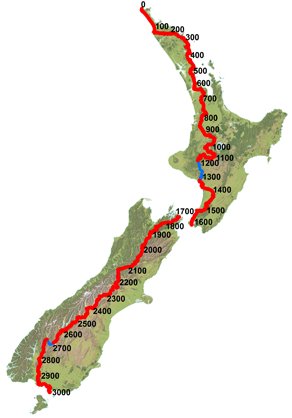 Rather than walk the route from Wanaka to Queenstown I’ll be walking through the Matukituki Valley to take in the climb over Cascade Saddle and follow the Dart Track down to Glenorchy before continuing on the official route. Possibly continuing on the Routeburn Tk and linking onto the Greenstone Track. A very, very rough idea of where I’ll be at different times of the walk are listed below. If you are keen to join me for a short section or perhaps multiple sections this will give you an indication of key timings. However it is impossible to have any real concrete plans for such a long walk and any itineraries over a week can be basically be thrown out immediately. Your best bet to find out where I am, how I’m tracking and likely timing of hitting towns is to follow my daily updates, check the TA facebook page, track my SPOT or View Ranger positions.